Bowls is a fun and social game, enabling participation for all regardless of skills, physical fitness level or age. We welcome anyone of any age to come and try social bowls and barefoot bowls. Social Lawn Bowls is held Wednesday 1:00pm and Sunday 1:00pm. 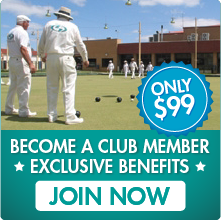 Click here to download information on upcoming Barefoot Bowls.